The new garage / workshop roof begins! As Autumn kicks in with a vengeance, I’m so relieved to be at the stage where the workshop and utility are semi-watertight with breathable membrane and the roof timbers to the main extension & dormers will be up by the end of this week. Starting a large extension / build in late summer often means you hit wanting to be watertight right when water starts falling out of the sky, which isn’t perfect! Amazingly for us the weather has mostly held off during the day meaning fewer delays and soakings for the lads. So we’ve got to the stage when lots and lots more 20 inch by 10 inch slates are required asap. I should really have addressed this sooner and already had the tiles here on site but recent events knocked all the schedule out! 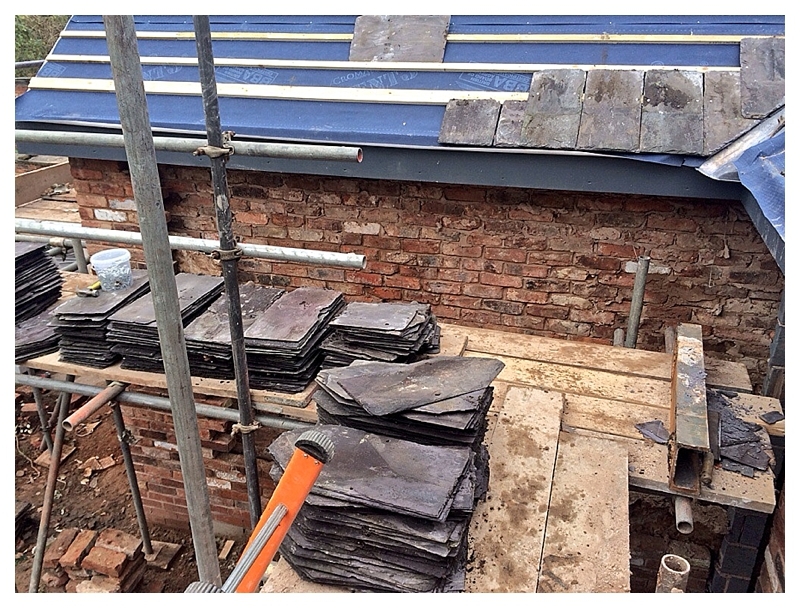 When the original West Wing was dismantled, approximately 500 original slates were carefully removed and stacked ready to be re-used, however the larger replacement extension, newly built workshop and utility means we need about 1800 more. This means sourcing ones which match in size, colour, style and thickness. No mean feat. Plus the added challenge that even though everyone has tried to persuade me otherwise, I’ve decided I want to replicate the original fish-tail pattern on the visible roof pitches. This means much more labour as there are so many cuts to make to rectangular slates. And what does extra labour mean…. extra cost! Take a picture of your original roof, especially if patterned, as a good point of reference for your roofer. Take a measurement of the slates or tiles removed from your existing roof so you know what to buy to match in with your existing. There are lots of different sizes out there. 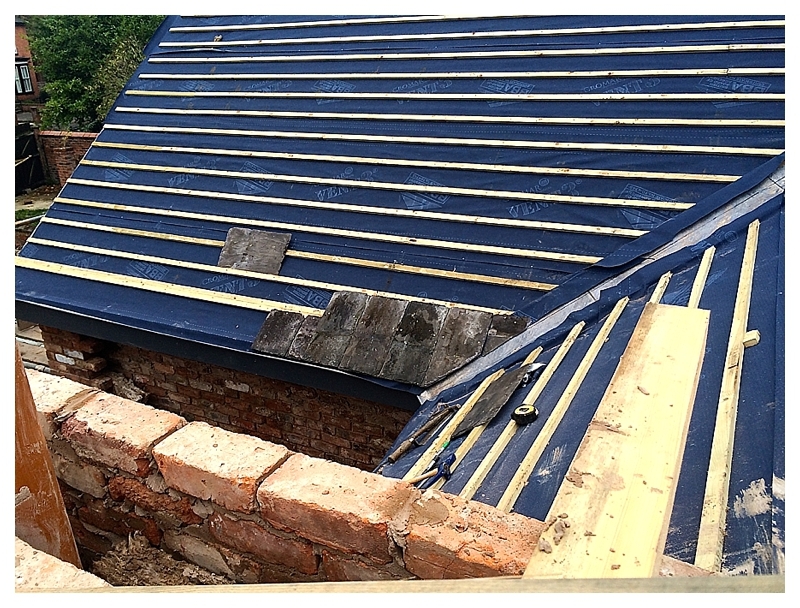 Get advice on what slates / tiles you are matching to from a good roofer. Ours are Welsh Penrhyn size 20″ by 10″, known in the industry as Countess tiles. I love the naming of all the different sizes of slates as aristocratic ladies in 1738 by General Hugh Warburton. Do you want to source original Welsh slate or go for cheaper Spanish or Chinese slate? For me it was a no brainer, Welsh all the way and locally reclaimed too. Lots of the cheaper versions are very thin and quite wishy washy looking. I wanted ours to look solid, robust and natural. I guess if you’re doing a new build it might not be as important to use reclaimed but we are matching in to an existing main roof. Ask local, reputable roofers where they source their slates from. They’ll usually know the trade yards and best contacts, plus will give you a guideline on price. People do sell reclaimed slates and tiles on Ebay and Preloved etc but I found that they were in relatively small quantities, 50 – 200. That might be perfect for you if you’ve only a small roof to do. Remember if they’re not local, factor in delivery or fuel. When you go out sourcing, take a couple of your existing tiles to compare colour and size. Slates vary hugely in thickness. Good roofers grade mixed thickness batches and use the thicker ones at the bottom of the roof, thinner at the top. Try and buy all from the same batch to get uniformity. 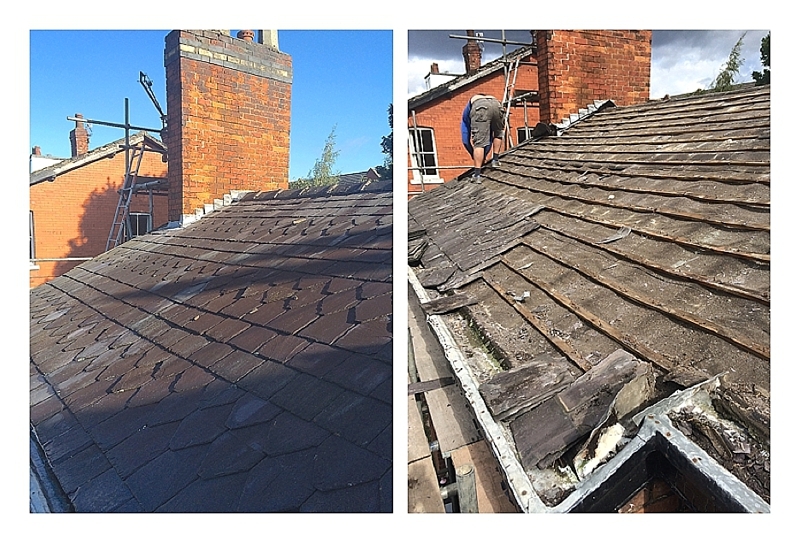 On saying that we’ve had four different batches of similar thicknesses but our original roof slates were quite an eclectic mix in the first place so I like that look. I was told to watch for powdery, crumbly tiles, it’s a sign they’re degrading and on their way out! Think about it though. 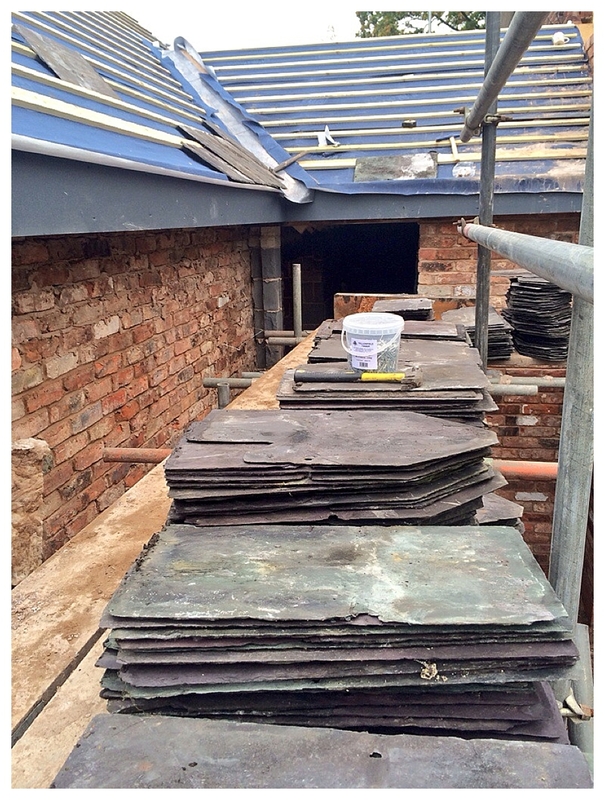 If reclaimed, the slates you’re examining could have been on their original roof for 100-150 yrs, and you want them to last on your new roof for many years to come. Don’t scrimp on quality. Reclaimed slates often have to be redrilled to get nails into their new batten position. Thin, battered tiles often crack and are wasted. Different slates of different sizes cost a different price per tiles. Do some online and ask around research to find what you should be paying. All reclaimed stuff has gone up in price over the last few years, as has all building materials costs actually. Haggle but be realistic. That perfect pallet will probably gone tomorrow if you don’t buy it today! If you are local to Manchester / Stockport give Paul Stanton a call on 07718 499754, he’s at Cheshire Slate & Tile where we sourced our slates, very helpful, recommended. I appreciate the work, putting this type of roof is exhausting.